It began in Ethiopia, hundreds of thousands of years ago. When a handful of genetic mutations caused evolution to split from the primates. Now, eons later, evidence of more splits from the apes are being unearthed. And with them, a disturbing realization. Ours was only one of many. And yet we survived. But it was not by luck or by chance. We survived because humans had something the others did not. A unique ingredient that has only now been rediscovered. First in the mountains of South America, where it was promptly destroyed by the Chinese. And now a second source in Africa. The epicenter of mankind’s very inception. A place that John Clay and Alison Shaw must find quickly. Because the Russians already know what we are searching for. And the Chinese want back what is rightfully theirs. The mother of all secrets awaits the world, in Africa. One that will not only explain who we are, but will decipher the very code within our own DNA. Les Gorski stared through his dark-framed glasses with a weary expression. Most of the men before him were not the normal soldiers he was used to working with––those with a grizzled toughness and the ability to endure extreme conditions. This group was very different. Instead of fighters, these men were engineers. Smarter but softer. Navy engineers who, along with Gorski and his own team, were there for one reason and one reason only. Watching as the row of men donned their gear, Gorski turned around and glanced out over the emerald waters of the Caribbean Sea. Gorski stood firmly on an oil platform approximately one hundred miles off the island of Trinidad. All of it was nothing more than a cover, he mused. A smoke screen. A story concocted by the U.S. Navy, in which the obsolete oil platform had experienced a technical malfunction on its way back to the scrapyard. But in reality, the Valant had been stopped precisely in its current location to conceal something discovered in the waters beneath it. Something astonishing. Something that could have been ripped straight from the pages of a conspiracy handbook. But there was no conspiracy. This time, it was real. No painted stories or embellished eyewitness accounts. In an ironic twist, it was much simpler than that. The first verifiable extraterrestrial craft ever to be found on Earth. Underwater and buried beneath hundreds of feet of coral. That was why Gorski and the team were there. Which now included his new group of soft and inexperienced divers. There was however, one exception. Gorski glanced back from the rising sun, down to the large face of his wristwatch. They had to hurry. They had precious little time to find out just what they were dealing with. Before anyone else did. Two stories above Gorski, Will Borger sat in a ratty old chair, staring at an even older CRT-style computer monitor. The quarters module of the aged oil rig left a lot to be desired, both in terms of comfort and technology. But it was good enough. At least for this mission. Borger’s large, overweight frame remained motionless as his eyes darted to a second monitor with a live feed of the dive team below him. They were the engineers from the naval research ship Pathfinder, now anchored less than a thousand meters from the edge of the giant rig. What they were doing had to be done quietly. With the least amount of resources possible. Not because of a lack of funding––Admiral Langford and Secretary of Defense Miller were making sure of that. It was to avoid attention. They couldn’t risk being noticed. By anyone. The official explanation for the oil rig and the Pathfinder ship was thin but just enough to keep the operation quiet and away from the attention of any other U.S. government entities. And from the rest of the world. Borger’s tired eyes returned to the first monitor, and back to one of the recordings the team had made beneath the surface. Detailed images capturing large sections of the alien ship’s dark gray hull; smooth and unblemished. So far they had only traced a small portion of the structure through the maze of coral and vegetation. Two things had immediately become obvious, given its position and orientation. The first was that the ship was big. The second was that it hadn’t crashed. It was buried. Intentionally. Borger crossed both arms over his large stomach, which rested beneath a loose-fitting blue and green Hawaiian shirt. His steely eyes stared at the visible portion of the hull in the underwater video. Dozens of questions raced through his mind. Questions that couldn’t be answered. Not yet. Borger twisted slightly in the chair, causing it to squeak. The room around him remained silent, much of its faded interior paint now peeling and giving way to dozens of small patches of rust. However, the one thing Borger was extremely thankful for was the air conditioner. Although on its last leg, it was still pumping out enough cool air to keep his perspiration to a minimum. He leaned forward and began typing on the keyboard, zooming in on the video and playing the last part of it back. Steve Caesare, one of the divers, could be seen touching the alien ship’s hull, brushing his hand firmly against it. Each time he did so, a green glow appeared and traced his motion before fading again. None of them, including Borger, had ever seen anything like it. The effect was so strange that every time Borger watched it, the same thought ran through his mind: What the hell was that? Half a mile away, aboard the Pathfinder, Neely Lawton had a similar thought. As a systems biologist, Neely was staring at her own monitor, observing something very different taking place. She was far more interested in the plants and vegetation surrounding the alien craft than the ship itself. Or more precisely, the genetic behavior of those plants. She breathed in, barely moving, watching the image on her screen with fascination. A small dark-green tube from a sea whip lay on a flat glass Petri plate, positioned beneath a large Euromex biological microscope. Its powerful lens focused in on the severed end of the fibrous tube. In silent amazement, Neely watched as the damaged cellulose fibers moved like tiny searching fingers. Then very slowly, and one by one, the microscopic fingers found each other and began rebuilding, weaving themselves back together. At a speed that was simply stunning. It was only the second time she had ever seen it. The first time happened with a different plant, pulled from the jungles of Guyana. A plant that was very different. But their structures, or more specifically their DNA, were very similar. Both plants possessed the same incredible healing properties she was now witnessing. The testing of the plant’s genetic behavior was easy to replicate. And like the first sample, this one’s behavior also mimicked one of the smallest and most sinister living organisms known to man: the human cancer cell. Yet, unlike a cancer cell, these plant cells were not dedicated to the growth of a deadly tumor. The reconstruction witnessed here applied to all parts of the plant’s biological structure. And it worked just as fast. Another difference was that cancer cells were the result of a more natural biologic breakdown caused by damage to DNA base pairs of a cell’s genes. The plant’s cells, on the other hand, had mutated as the result of a compound from the alien ship. A catalyst they had yet to fully identify, let alone understand. Neely bit her lip, keeping her eyes on the monitor. From a scientific standpoint, the process she was witnessing was…almost magical. Far beyond anything she ever expected to see in her lifetime. But there was no denying it now. Test after test showed the same behavior: a holy grail of modern biology. The rapid-growth behavior of a cancer cell, without the horrific repercussions. Yet as quickly as Neely Lawton’s excitement grew, a worry was also building. Yes, the plant cells had a very similar DNA sequence to cancer, with none of the side effects. At least none she could detect. But the strain had yet to be studied in a larger, more complex environment. Neely relaxed, then took a deep breath and stood up. The small room had become uncomfortably quiet since the rest of her research team was abruptly reassigned to another ship. It was all part of the ruse. She faced another table with neatly organized testing equipment, including a small matrixed tray with thirty-six shallow Petri dishes, all containing a small amount of pink liquid. In each, a small sample of the bacterium had been injected into a common microbiological nutrient broth. And just as it had done previously aboard the Pathfinder’s sister ship Bowditch, the bacteria began to replicate. Rapidly. She reached down and pressed a button on her keyboard, causing the powerful electronic microscope to zoom out slightly. The culture she had been watching was already growing too large to fit within the dish. Splitting, and then in just thirty minutes, splitting again. By tomorrow, the new cells would take over the broth and consume the entirety of the medium, exhausting its food supply. As Neely continued staring down at the metal table, the same nagging question surfaced again: What was the catch? Every breakthrough came with a cost. Nothing was free in this world, especially in the field of science. Each discovery, no matter how small or how profound, came with its own set of limitations. Its own set of complications, and more specifically, its own rules. Her overarching question was simple. What was the bad news? She folded her arms and frowned. Pushing the thought away, she then glanced up through the front glass door of the short laboratory refrigerator where several stacks of test tubes were held firmly in place inside. There, more of the bacteria was divided into small sample groups and held at near-freezing temperatures. They had nearly lost it all––if not for the last remaining trace of extracted DNA, retrieved by a single man in one of the greatest acts of courage she had ever seen. The man’s name was John Clay. Considered attractive by most measures, and above average in height and build, Clay sat quietly on the edge of the large seawater tank in Puerto Rico. He wore a slight frown on his face, his eyes closed. Above him, the sky was filled with muted gray clouds. He nodded and opened his eyes, peering into the face of Alison Shaw, who sat near him. 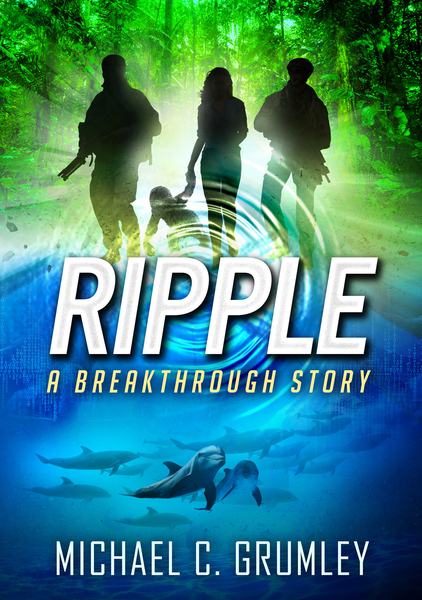 Both had their legs dangling into the cool water of the research center’s giant tank. “I’m okay,” he responded quietly. With some effort, he pushed himself up straighter and grimaced at the pain. His body was badly battered, deep purple bruises covering much of his chest and arms. The exposed areas of his legs didn’t look much better. His eyes stared back at her with deep affection before finally returning to the water. Several feet away, Dirk and Sally waited, their heads bobbing out of the water excitedly. It had been almost a month since Clay had found himself literally moments away from death. Saved only by his wits and a monumental stroke of luck. He had only recently been released from the hospital in Honolulu and traveled back to Alison’s research center in Puerto Rico. Alison shared with him what had happened with a young girl named Sofia, who was suffering from leukemia. It might have been easy to dismiss the event if it had not also happened with Juan’s younger sister. And if Clay and Alison hadn’t known what was really behind the miracles: their discovery near Trinidad. Now Clay sat on the concrete edge of the tank with Dirk and Sally waiting. The sound emanated from a computerized vest worn by Alison. Dirk opened his mouth and wiggled his head, and the vest responded with a sound Alison knew to be laughter. Sitting beside him, her eyes narrowed momentarily as she wondered if Dirk had just gotten John’s joke. She let the thought go when Clay groaned and moved himself forward. He felt silly with the floatation belt wrapped around him but the less he had to move to keep afloat, the better. And under the circumstances, Clay decided pride was the least of his worries. With gritted teeth, he eased himself into the water and immediately bobbed back up to shoulder level. His arms gently waved back and forth, providing just enough motion to keep his body upright. Alison slipped in behind him and floated close by. Her eyes filled with empathy. Clay was not one to complain. Not surprising giving his previous life in the Navy, but it pained her heart to see him in so much agony––a suffering she could do so little about. Except for getting him here and into this water, along with whatever miraculous properties it contained. It did help. Just the sensation of being back in the water helped Clay relax, allowing his face to soften and floated effortlessly on his back. Dirk’s head abruptly rose from the water beside him. After staring at John, he spoke, and Alison rushed to get her earbuds in for the translation. Me good. How you Alison? You home now. We talk. We learn people. After a pause, Sally finished the sentence. You learn us. Sally was still attentively watching Alison, seeming to smile. There was something in Sally’s face, in her mouth, that Alison was able to recognize. She wasn’t sure what it was––perhaps a slight change in the curvature of Sally’s mouth, or maybe just a feeling, but she could tell. Sally was smiling at her. There was a pause in the translation––a sign that Lee Kenwood had explained as a conflict. A moment where the IMIS system was unsure of the right word given the context. When it made its decision, the word finally sounded through her earbuds. Alison was taken aback by the question. How do we love? She couldn’t help but glance over at Clay, floating quietly. Did she love Clay? Yes, she did. She had just spent a month with him at the hospital. And he amazed her now even more than before. His injuries were extensive, but he barely complained. Instead, he was driven more by a feeling of gratefulness than anything else. Nor would he tell her everything that happened to him in China. He refused to burden her with it. With the visual images of what he must have endured. What he did reveal to her, however, was that at a certain point he was convinced that he wouldn’t be coming back. And what he said then brought Alison to tears. In his darkest moments, it was thinking of her that got him through it. Just thinking of his story caused tears to begin welling up again in her eyes. Alison quickly shook her head and focused more intently on Sally who was still waiting for an answer. There was something about the way she asked the question that left Alison doubtful of the translation. She didn’t think those feelings were what Sally meant by love. “How you love?” Alison repeated to herself. “How you…love.” Love could be used in so many ways. In this case, it wasn’t a noun. It sounded like Sally was using it as a verb. Alison looked again to Clay who was looking at her curiously. He hadn’t heard the translation. Sally repeated the question. How you love? How love Alison? How people love? It took Alison a full minute to eventually get it. To finally understand what Sally meant. It wasn’t until she turned the question around and considered what were the most common, and perhaps most primal, questions humans asked when discovering a new species. What Sally was asking was not how humans actually love one another, but rather how humans reproduce. Clay now peered at her more intently. A nervous expression crept across Alison’s face inside her mask. Under the circumstances, she wasn’t about to touch Sally’s question with a ten-foot pole. DeeAnn Draper stood silently beneath the large netted ceiling of the habitat. Her hands on her hips, she watched as Dulce studied the object in her human-like hands. It was an old Rubik’s cube, and the young gorilla was absolutely fascinated by it. Of course, DeeAnn held no expectation of her solving the puzzle. Although from an educational standpoint, it helped Dulce better understand the concepts of three dimensions and patterns while improving her fine motor skills. Pattern recognition was a key element in gauging intelligence and overall cognitive ability. But what interested DeeAnn even more, was the small capuchin’s interest in the cube. Sitting on a large rock next to Dulce, the more reserved monkey Dexter was also studying the toy intently. When Dulce would periodically turn one side of the cube, Dexter promptly cocked his head and studied the bottom of it. It reaffirmed her belief in how intelligent the older creature really was. DeeAnn’s thoughts drifted momentarily to her old friend Luke Greenwood, the man who had discovered Dexter and the first to suspect just how special the capuchin was. A discovery that ultimately cost Greenwood his life and very nearly DeeAnn’s. But Greenwood’s instincts had proved correct. So far, every test DeeAnn had administered clearly substantiated his hunch. For a capuchin, Dexter’s intelligence was literally off the charts. DeeAnn’s phone suddenly chimed, and she reached down to retrieve it from her pocket. It was a message she’d been expecting. She looked back at the two primates. The young gorilla looked away from the cube and blinked happily at DeeAnn with her soft hazel eyes. DeeAnn smiled and looked at Dexter, who had not taken his eyes off the cube. She then glanced around the habitat, noting the dozens of high-resolution cameras surrounding them. It was peculiar. Using a wireless connection to the IMIS computer system, the vest translated everything Dulce said. At least to her. What it wasn’t translating was anything Dulce said to Dexter. Even when they were clearly communicating with one another. One of DeeAnn’s former colleagues had published the first examples of instinctive signing between primates, and DeeAnn continued to witness it now firsthand. But the IMIS system, even as powerful as it was, was not picking up any of it. Something she would have to bring up with Lee again. When he was ready. She let herself out through the wide glass door before reaching down and turning off the power to the vest. She had something more important to talk to Lee about right now. They all did. Lee Kenwood looked up as Alison and Clay entered the computer lab. The large metal door swung closed behind them with a loud click, and Lee instinctively rose from his chair to get Clay a seat. Lee nodded and looked up to see the door open a second time, with DeeAnn stepping quietly inside. He looked back to Alison and Clay. The lab was quiet, eerily so. In the absence of their colleagues Juan Diaz and Chris Ramirez, the entire research center didn’t feel quite right. It felt…empty. “We all are,” DeeAnn replied softly. “Okay.” He reached back for the arm of his chair and lowered himself down. “That’s what Juan was killed over,” Clay said. “Including your wife,” Alison added. Lee sat in stunned silence. He continued staring at them, trying to grasp the meaning behind all of what they just said. His reaction felt strange. After all the years of speculation, of movies and stories about aliens, now for it to actually be real, felt…odd. To that, Clay turned to DeeAnn. “And no one can find out,” Clay finished. “Phones would be restricted to only a few numbers, and encrypted.” Clay paused and took a deep breath. The next part was something he hadn’t spoken to the others about yet, not even Ali. But Langford and Miller were adamant.